At Keith Graham Hairdressing, we believe to get the best out of your hair, we need to feed the hair. Like skin, your hair needs protein and moisture to keep its flexibility. Whether you need shine, manageability or just time out of your busy schedule to relax, we offer a range of treatments to help you manage your hair at home as well as in the salon. From frustrated to fabulous - The Kerasilk Keratin Treatment Service provides long lasting transformation into smooth & soft hair for upto 3-5 months, when using Kerasilk Control shampoo & conditioner. 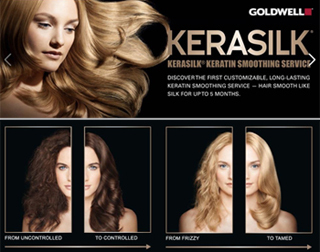 The Kerasilk Keratin Smoothing treatment reduces curl by upto 50% and smooths the hair reducing frizz and styling time. An intense head, neck and shoulder massage. This massage will leave you feeling relaxed and stress-free. A backwash experience using the Tea Tree shampoo, conditioner and hair and scalp treatment. This invigorating massage will leave you feeling refreshed and includes a mini facial. Information will be updated very shortly! Strong healthy hair begins with this revolutionary Keratriplex Treatment. Step 1 - a concentrated application of Keratriplex Keratin Protien is applied and absorbed into the hair to repair and seal damaged areas. Step 2 - A keratin intensive treatment is applied to hydrate and add shine when the keratriplex protien is absorbed into the hair. The keratin intensive treatment improves hair quality and texture. This treatment is followed by a shiatsu massage for the scalp plus a hand & arm massage including a blow-dry. 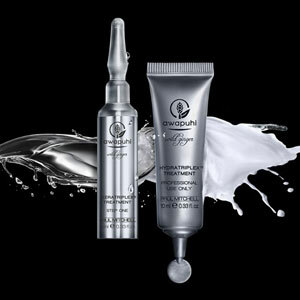 Awapuhi Wild Ginger treatment is recommended for naturally dry, sun damaged, lightened and chemically treated hair.